There are over 80 people in Clanabogan, living in five households on the estate. 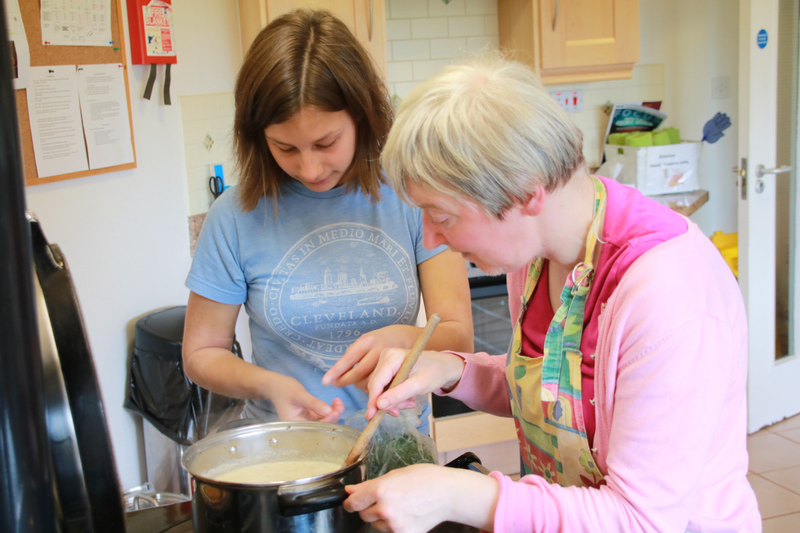 The households, varying in size from 9-15 people, are comprised of adult residents with learning disabilities, a home coordinator and a team of coworkers and support carers. In some houses there is a family with children. The home coordinator is responsible for the wellbeing of all in the house, for the guidance of the coworkers and carers, and for homemaking. Daily chores are shared as much as possible. Everyone contributes to making the house a home. A beautiful environment is seen as important for the wellbeing of people in the house, and attention is paid to colours, flowers, plants and seasonal decorations. Many natural materials are used to decorate the homes. All inhabitants have their own room, where they can have privacy, spend time with friends, listen to music and relax. Residents are free to bring personal furnishing and decorate their rooms to their own taste. House kitchens, dining rooms, and sitting rooms are shared as social spaces. Meals are prepared in the houses according to the choice and taste of the individuals life sharing in the house community with room for individual diets and needs. A special provision is made in some houses where the ageing residents can enjoy a slower pace of life, with less emphasis on work, and more emphasis on cultural activities and events all throughout the year.